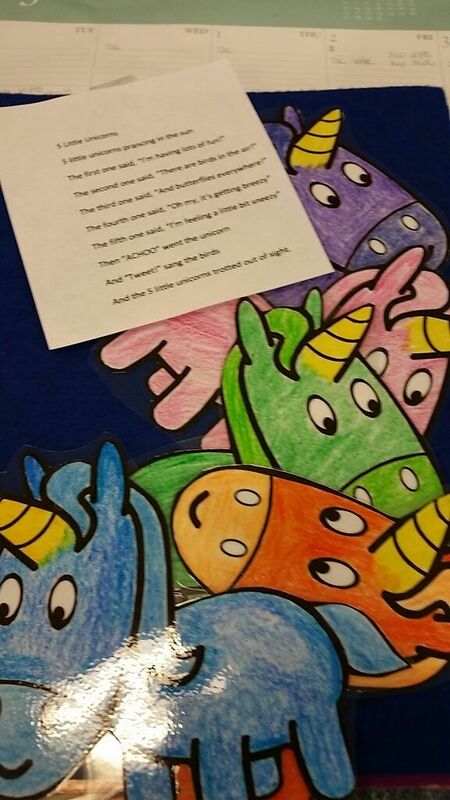 This storytime brought together creatures from all over the world and folklore to celebrate those with a single horn or tusk: unicorns, narwhals, and Indian rhinos (on my!). Fun fact learned while prepping for this storytime – the greater one-horned rhinoceros and the Javan rhinoceros have one horn, while black, white and Sumatran rhinos have two! I showed kids pictures of narwhals, a rhino from books, and put up a flannelboard unicorn I had made to see if they could tell me what they all had in common. Then we stomped some more like rhinos, pranced like ponies, and swam like narwhals. when I blinked by eyes, it pranced away, and then there were none. After Zara reads a story to Laurence about a unicorn, he really wants to meet one. Can Zigby and his friends help this happen? We didn’t have any good videos with uni-horned animals in our collection, so I streamed this one from Amazon prime using my iPad and our Apple TV mirroring. This was a fun theme! I wish I could have though of some better action movements to go along with it though. Anyone have any ideas? Also, I am not sure that was the best video to show – it seemed a little long. But I was having a hard time finding one to tie into the theme. I was hoping some of our nonfiction DVDs would have a good segment on rhinos, but all of them seemed to be focused on the two-horned variety. For our last storytime of the Fall session, we celebrated the start of a new season with stories of snow (even it was a little early for that.). One little snowpal melted away. I’m not sure that The Snowy Day worked well as a toddler video. It might be better for a preschool audience. Even though it’s not yet December, we shared stories about Snow for our last storytime of this session. and a scarf of red. Three, four, knock on the door. Five, six, pick up sticks. Seven, eight, lay them straight.